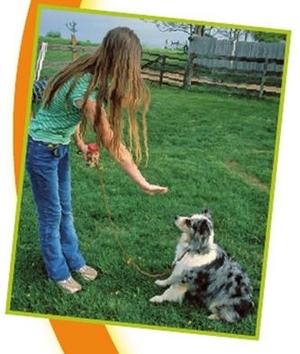 Teaching a pet to stay is not always easy, but it is very useful. Your pet will need to know how to sit or lie down ﬁrst. Begin by putting him in a sit or a down. Once he is in position, say “stay” and put your open palm in front of his face. This will be your stay signal. Wait just a few seconds, and if he hasn’t moved (you shouldn’t give him enough time to), say “good!” and give him a treat while he is still in position. You can’t ask your pet to stay forever. He needs to know that stay means “stay there until I tell you that you don’t have to stay anymore.” You’ll use a word such as “okay!” to let him know that he can get up and move around. This is called a release word. To practice the stay, ask your pet to sit or lie down, give the “stay” cue, wait a few seconds, and then give him a treat and say “okay!” Gradually increase the time he has to stay in position to get the treat. When he gets good at this, don’t always release him right after he gets the treat. Have him stay for a few seconds, give him a treat, and then have him stay a little longer before he gets another treat and is released. If he has trouble, go back to a shorter length of time. Remember that this will take awhile for him to learn, and be patient. Once your pet is beginning to get the idea, you can start adding distance. Start by going only a step or two away for a short amount of time. As he grows more conﬁdent, you can increase the distance you step away from him. Eventually you will even be able to go around corners and out of sight without him getting up— although that takes a lot of time and practice. If your pet gets up before you release him, quietly lead him back to where he is supposed to be and put him back in position. Then repeat the cue “stay” and try again for a shorter time. If your pet is staying but looks like he might get up, try reminding him by repeating “stay” in a quiet voice. Hearing the cue again may remind him of what he’s supposed to be doing. To get a reliable stay, you will need to practice in many different places. For dogs and cats, this means practicing both outdoors and indoors—especially with dogs. When you’re working outdoors, unless your pet is 100 percent reliable on the come cue, keep him on leash or in a fenced enclosure. Be patient when you and your pet are working near new distractions. Most pets have trouble realizing that an old cue in a new situation is really just the same old thing. Your pet may need help remembering what you want him to do. Go back to short times and distances, and work your way up in each new place. You will be able to increase your time and distance more quickly because your pet already knows what he should do. He just needs to understand how to apply it to a different setting.